Sometimes the sincere and simple words are all that is necessary to express your love. This quality crafted, clear lucite block features delicate beveled edges to beautifully reflect light around the heart mosaic design. 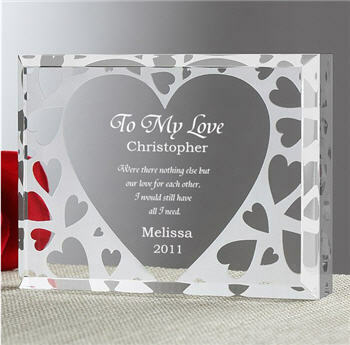 It is then personalized with the recipient's and your first name along with a fantastic message about love. This is a Romantic / Valentine gift that you can truly call your's. Glistening lucite block measures 4"L x 3"H x 1/2"D.
Verse reads: Were there nothing else but our love for each other, I would still have all I need. Personalization Details: Recipient's and Sender's name up to 12 characters will be inscribed on the block.